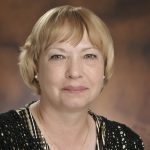 Dr. Phyllis Genther Yoshida is the Senior Fellow for Energy and Technology at Sasakawa USA. Prior to joining Sasakawa USA, she served as Deputy Assistant Secretary for Asia, Europe, and the Americas at the U.S. Department of Energy (DOE), coordinating bilateral relationships and serving as the Lead Shepherd of APEC’s Energy Working Group. She also served as DOE’s Director of the FreedomCAR and Fuel Partnership, a government-industry cooperative research partnership. My husband’s paternal grandfather, Denzo Yoshida, left his Komoya home in 1896 to cut sugar cane in Hawaii. His maternal grandfather, Toyoki Seriguchi, left his Asahimura home around 1906 to work as a miner in Mexico. Within a few years, like many ­ issei (first-generation Japanese Americans), both left the harsh conditions of the sugar cane fields and the mines for better opportunities in California, where they married and started families. Denzo became a barber in Anaheim and married Kame Nakagawa, who came from Fumoto close to his hometown in Kumamoto. 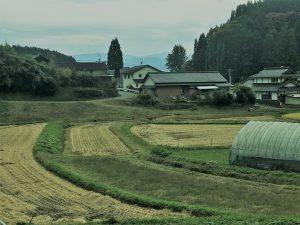 Toyoki became a foreman on a farm in the Imperial Valley and married the owner’s sister, Koharu Ishimura of Itoshima in Fukuoka Prefecture in Kyushu. With this much to go on, we hired a local guide, Ikue Kondo, in Kumamoto who had helped other Japanese Americans find their hometowns. She found the villages of Komoya and Asahimura, something we had tried but couldn’t do. She managed to obtain kosekis for Toyoki Seriguchi and Kame Nakagawa which led her to discover that, during the last 100 years, the grandfathers’ villages had acquired new names. Komoya is now Nobara, and Asahimura is Kawaguchi. After getting the kosekis that helped pinpoint addresses, she helped us write letters in Japanese to send to the Yoshida, Nakagawa, and Seriguchi families living in his grandparents’ home towns asking if they knew of any descendants or locations of family graves. We certainly didn’t expect replies on short notice to letters from complete strangers, but at least hoped to see the villages. Surprise! The guide received phone calls from families with all three names. Unfortunately, there were no related Nakagawa family members left. An unrelated Yoshida called and went out of his way to check other nearby Yoshida families. His childhood friend, also a Yoshida, checked with his aunt, now in her 80’s, who remembered hearing about Denzo Yoshida! He is a descendant of the brother of my husband’s great-grandfather and invited us to visit. 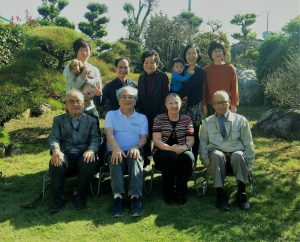 We ended up spending a fantastic day with the Yoshida family – two uncles, the aunt, a sister, his wife, son, and grandnephew. 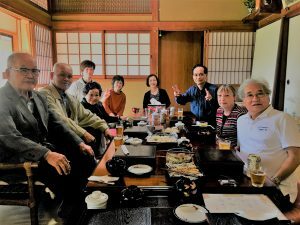 We had a sushi lunch at his home, shared (and took) pictures, visited the family grave and the local shrine of which the family is a major supporter. We learned the Yoshida family kamon or crest is two uncrossed hawk feathers and is from the Kikuchi clan of Kyushu which is famous for heroism in repelling the Mongol invasions. Nobara is on a plain and is now part of Arao City. Our host is a veterinarian and his son works for Arao City. The aunt runs the local rice cooperative and is a great cook, providing fish caught that morning by her neighbor, homemade bean and kasutera cakes, and a salad to the lunch. One uncle used to grow nashi (pears) but with climate change now grows enormous Shine muscat grapes. The other uncle is retired and had worked in the construction supply business. We came home with local pottery, a big kokeshi, and other small gifts. We left them candy, books, and pictures of the Yoshida family in America. A descendant of Toyoki Seriguchi’s older brother answered our letters as well. He was unable to meet but introduced us to the family’s Buddhist priest. He also told us the location of the family grave which he had moved from up on the mountain to the village a few years earlier. It was amazing he got our letter as his father had been adopted by another family so his name is no longer Seriguchi but Uemura. The priest met us at his temple and performed a special ceremony in honor of Toyoki’s parents and drew for us calligraphy of their Buddhist names. He talked to us about the history of the area and showed us the handwritten entries about the family in the temple records. He said the Seriguchi family has lived in the area for as long as 200 years and likely longer. The temple records have no family names recorded before Meiji, which is typical as it was uncommon for Japanese commoners to use family names before that time. We also visited the family grave. Kawaguchi is a very small farming village on the side of the Mount Aso volcano and even now is isolated. It must have been a hard life. What did we learn? We can now visualize what their lives must have been like in Kumamoto. Times were difficult. The Kumamoto Prefectural government actively encouraged emigration and provided some support including qualifying companies that contracted for workers to go overseas. Denzo Yoshida went to Hawaii at 25 with just such a company. Toyoki Seriguchi was only 17 when he was one of 530 Japanese recruited to work in Mexican mines between 1904 and 1907. The Yoshida family were farmers on a fertile plain while the Seriguchi family were hardscrabble mountain farmers. Did they ever plan to return to Japan? There is no evidence that they did. Life was better in California and their children were Americans. What is next? Our Yoshida cousin realized how little he knew about his own family’s roots and is investigating. We will relay what we found to the rest of the family, try to stay in touch with our new cousins, and visit Fukuoka to discover the home of Chuck’s maternal grandmother. Memories grow dim after three generations. Both families are like rivers that diverged and flow on separate paths without much in common but still spring from the same headwaters. It was good to reconnect when memories, while dimming, still existed. It was wonderful to learn that it is possible to be welcomed home again even after 100+ years.